A Facebook memory popped up this week with a picture of me smiling, hiking down a mountain with a pack on my back. This was me 7 years ago, embarking on a four-day hike down the Grand Canyon. 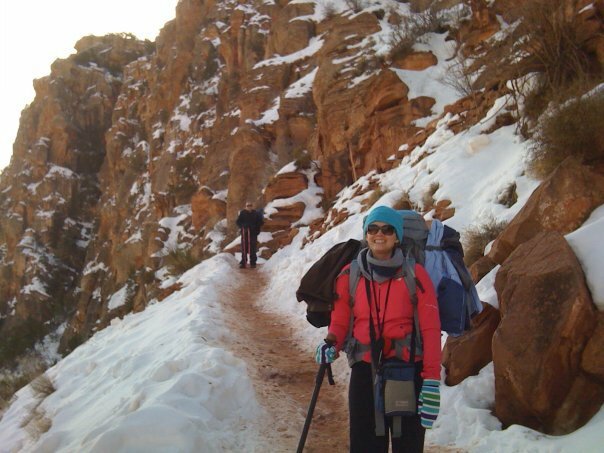 My first thought as I looked at the picture, as with many of my previous memories, was envy of my former self—a longing for days gone by when I could wear a pack and hike a mountain. These days, with my autoimmune issues and POTS (Postural Orthostatic Tachycardia Syndrome) just climbing a set of stairs about does me in (stairs are my nemesis!). However, there's much more to this picture than meets the eye. I had no idea of the grueling ordeal that was soon to come in the days after this picture was taken. 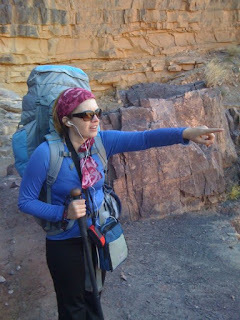 To set the stage, let me just say that I have never been super outdoorsy—Yes, I loved to ride my bike on the groomed trails around the lake, or go for day hikes in the mountains, but camping (and going multiple days in the dirt without showering) has never had much appeal to me. 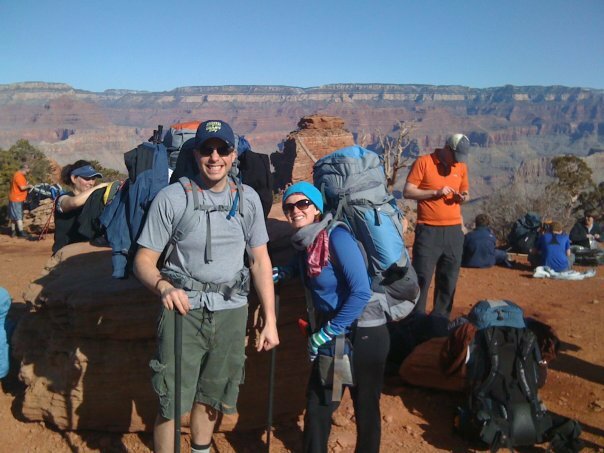 So agreeing to go on a four-day back-packing trip through the Grand Canyon was kind of a stretch out of my comfort zone. Also, I had just had a third laparoscopic surgery a couple months earlier (trying to cauterize my painful endometriosis, once again). So going into this trip, I hadn’t been able train as much as I would’ve liked post-surgery and probably wasn’t as prepared as I should have been. Things started out fine, but a few miles in to our descent I stepped on a baseball-sized rock that rolled underneath me. My ankle went one way and my knee went the other. Surprisingly, my ankle was fine, but my knee was tweaked a bit. I rested for a few minutes to “shake it off” before continuing on. In all honesty, it seemed pretty minor and had I not hiked another 5 miles at a very steep decline with a 40-pound pack on my back, I probably would’ve been fine. But by the time I reach the bottom I was cringing with each step. (A trip to the doctor after arriving home confirmed a pretty bad knee ligament sprain). My dad returned from the waterfall hike not feeling well and shortly after started vomiting—whether a stomach flu or severe dehydration we weren’t sure, but he continued to get sicker, weaker, and more dehydrated throughout evening. I was worried. He’d had a heart attack several years earlier; I was terrified that all the exertion and the sickness would bring on similar problems. 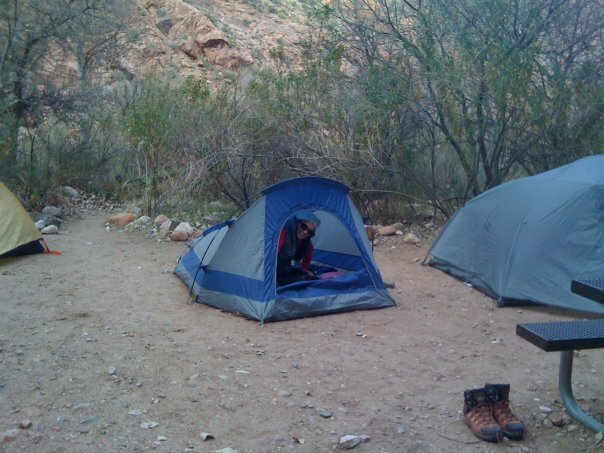 He was still sick when night fell and had to stay close to the bathrooms (amazingly, and thankfully, there are flush toilets at the bottom of the Grand Canyon), but they were not very near to our camp. I was worried about letting him stay there by himself. What if he had a heart attack and no one was around? Not that my limited CPR skills would be much good if needed, but, nonetheless, I sat on the cold ground outside the bathroom with my dad for the better part of the night. By day three our beautiful weather had disappeared, and a cold wet drizzle descended upon us. Although we were supposed to be starting our hike out that day, our group decided it was best to wait one more day and let dad rest and recover. We sought out some park rangers and asked if there were any other options to get dad out of the Canyon—mule, helicopter, etc. We were told that unless he actually did have a heart attack, in which case the cost to be air-lifted out would be an astronomical amount that we’d be paying off the rest of our lives, the only way out was to hike. I was dead tired after my night of no sleep. I went back to my tent to take a nap. When I woke up, I was completely soaked! The tent had leaked. Not only were my sleeping bag and pack wet, but my shoes had filled with water too. I burst into tears! I was so tired and cold. My knee still throbbed, and now everything I owned was soaked through and there was little chance of being warm or dry for at least few more days. That evening the park rangers sought us out to tell us that a huge storm was heading in and they wanted everyone out of the camp as soon as possible. Due to the steepness of the trail, we had planned to take a longer, somewhat less steep, trail out of the canyon and to split that hike up into two days. However, with the storm, we decided that it’d be best to make the two-day trip all in one day, leaving the following morning. The rain continued to worsen throughout the night. We had to double up like sardines in the remaining “less wet” tents and, needless to say, it was another long sleepless night. About half way up, we stopped to eat soggy granola bars for lunch. After resting for those 15 minutes, I tried to walk again, but my injured knee had locked up. It refused to go any further and every step on the muddy trail was torture. I burst into tears once again. How the (insert expletives) was I going to get up this mountain? I was so tired, so wet and muddy and cold, and my knee hurt so bad! 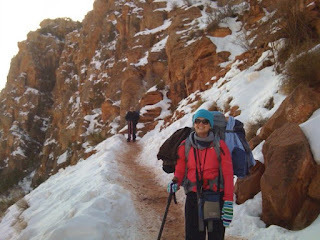 After letting myself cry for a few minutes with my husband standing by trying to be reassure me, but with little he could actually do to help (he’d already taken much of the weight from my pack for me), I finally had to pull it together and remind myself that there was no way out except to hike (trudge, trod, slog). 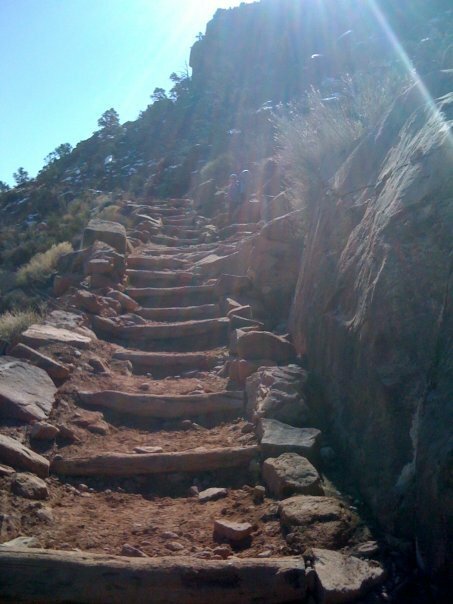 So I finally took a deep breath, told myself, “I can do this,” turned on my iPod, and started back up the trail. Not much further up the rains turned to heavy snow and ice—a blizzard. As everything we owned and wore was already soaking wet, we pretty much turned to ice as well. The mud mixed with slush and patches of slick ice. As we hit the last few miles with endless steep, icy switchbacks, I tried to keep my eyes on the prize. “I just have to make it to that next bend, then I can take a little break.” And at the next bend, I’d look to the next bend and repeat the same thing. Most of the time when I looked up, I couldn’t see the top—just more endless rows of switchbacks. How much further did this mountain go?! Would it ever end! As we hiked I thought a lot about the pioneers. I suddenly had a much greater empathy for them. This was just a four-day trek. I couldn’t imagine the feats they had been through over weeks/months. Additionally, I knew that I had a restaurant and a hotel room waiting for me at the top of the mountain with a juicy burger and a warm shower. The pioneers had arrived to an empty valley where they still had to build their own homes and grow their food. If they could do that, I could certainly do this! As long as this blog post is now becoming, it is not nearly as long as that 10-hour hike up the canyon. But, as I’m sure you’ve guessed, I did eventually make it out alive (and, in case you are wondering, so did my dad, who later confessed to me that he was, indeed, having chest pain for most of the trip. Thank heavens nothing major happened!). For the sake of brevity (oops, sorry, too late for that! 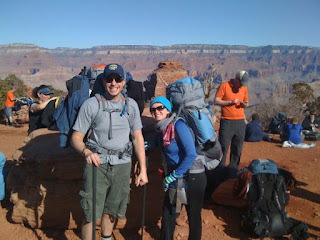 ), I’ll just point out a just few of the lessons I’ve been reflecting on as I’ve revisited my Grand Canyon memories. 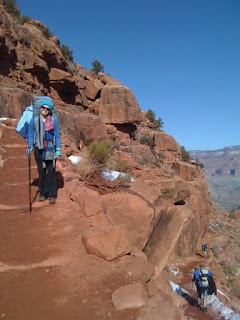 So back to the present day, as I mentioned, when my Grand Canyon Facebook photo popped up, my initial thoughts were of envy with the reminder that I once had the ability to hike, walk, climb, run, etc—something that I can no longer do (at least not without constant fear of passing out). Yet in reality, that was a harrowing experience and not a challenge that I would ever like to face again. Sometimes when looking at the past, I find myself looking through rose colored glasses. Because I’m still grieving for all the things I can’t do now, I often only see the “grass is greener” things from my past. I forget about the struggles I dealt with then. At the time of this hike I had actually been dealing with a lot of other trials. I have already mentioned my multiple surgeries for the crippling endometriosis I dealt with. I had also been struggling from years of infertility and failed treatments, and some intermittent depression as a result as well. My life in the past wasn’t as perfect as I sometimes remember. Yes, I had more physical abilities than I do now, but I also have some things now that I didn’t have then (perspective, stronger faith, deeper friendships, greater awareness of others, time to write really long blog posts…). I can learn from the past, but it doesn’t do me any good to dwell on the things I can’t bring back or change. I have to keep moving forward. As I thought a lot about the early pioneers on my hike, I similarly gain strength today by knowing that “others have done it.” Maybe they don’t have the same problems I have, but since my illness, I have become so much more aware of the trials that those around me have. I am in awe of the strength I see in my friends that are battling cancer, other health problems, financial struggles, or loss of loved ones. Their fortitude and courage in the problems they face help me in mine… if they can do that, then surely I can do this! From that hike, I found strength in myself that I didn’t know was there. It was one of the hardest things I had done, and I survived. It was a testament that I really could do hard things. Additionally, in remembering the dozens of silent prayers I sent up with each step of my journey, I would be foolish to not recognize that it wasn’t just my own strength I was relying on, but the strength of the Lord to help me through that ordeal as well. I have felt those angels, both heavenly and earthly. Today I still climb mountains—my mountains are just different. My mountains are making it through a painful and lousy day/week/month while trying to hold on to a positive outlook and not lose hope or faith. 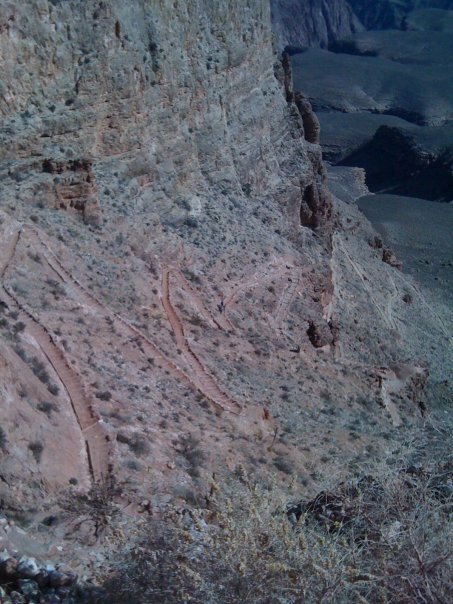 There are days where I break down and cry, “How the (many expletives) am I going to make it through this?” But just like on the trail of the Grand Canyon, I realize that I don’t have many options. I can sit down and wallow in the mud, or I can keep trudging, keep trying, keep seeking out something that is going to help as I continue to work on my faith and endurance. Although I can’t see the top of the mountain or the end of this journey, I can look back at the path I’ve come and gain strength and hope from seeing the trail I’ve traveled. It’s been a rocky road, but I’ve come a long way. Although there have been a lot of ups and downs, I have seen improvement since my first diagnosis (when I couldn’t even walk from my bed to the bathroom without collapsing, and I certainly wouldn’t have had the cognitive ability to write this ever-increasing lengthy post). I have also made progress on the road to acceptance and emotional healing. 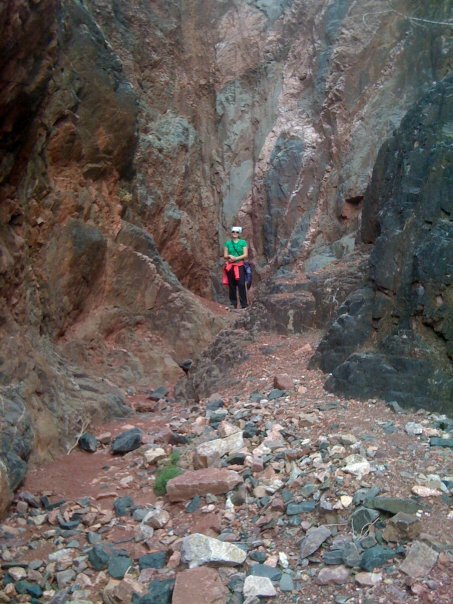 Although there may not be a true summit and complete physical healing for my condition in this lifetime, I can keep climbing, have faith, and try to take heart in the plateaus and vistas along the way.